"The series' many fans will be overjoyed to have this rich and reliable source to constantly draw from. Those not yet hooked will greatly enjoy the book and then plunge into the DVDs. Thanks to Andy Priestner there will always be new Secret Army fans." 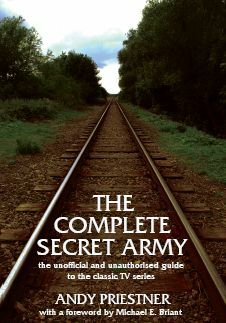 Description: This comprehensive book, an essential read for any fan of the series, seeks to uncover how the classic drama Secret Army was conceived and details its journey to our television screens. Each episode is reviewed in depth and accompanied by information on the actual historical events which inspired the series’ gripping storylines. - Information on the abortive reunion episode: What Did You Do in the War, Daddy? Andy Priestner has been a devotee of Secret Army since he first caught the 1981 repeat season at the tender age of nine. While freelancing for the DVD company DD Video in 2003 some 22 years later, the opportunity arose for him to produce special features to accompany their Secret Army boxsets and he leapt at the chance. While researching the booklets for the DVDs, Andy amassed more material than he could use, so the prospect of a full book on the series beckoned. The fact that, unlike sci-fi series, classic TV drama remains largely unexplored, has also encouraged him in this endeavour. N.B. The book weighs about a kilo hence the high postage costs!